Marie Godla was recently awarded a fellowship to attend the 13th International Summer School on Biocomplexity, Bioinnovation, and Biodesign in Istanbul, Turkey in June 2014. This Summer School is sponsored by the NSF and co-sponsored by the IEEE EMB Society, the Department of Biomedical Engineering at University of Houston, the School of Biological and Health Systems Engineering at Arizona State University and the Bogazici University. Approximately 30 students from around the world were selected to attend. Additionally, to support travel to this conference, Marie was awarded a conference travel grant from Cornell University. 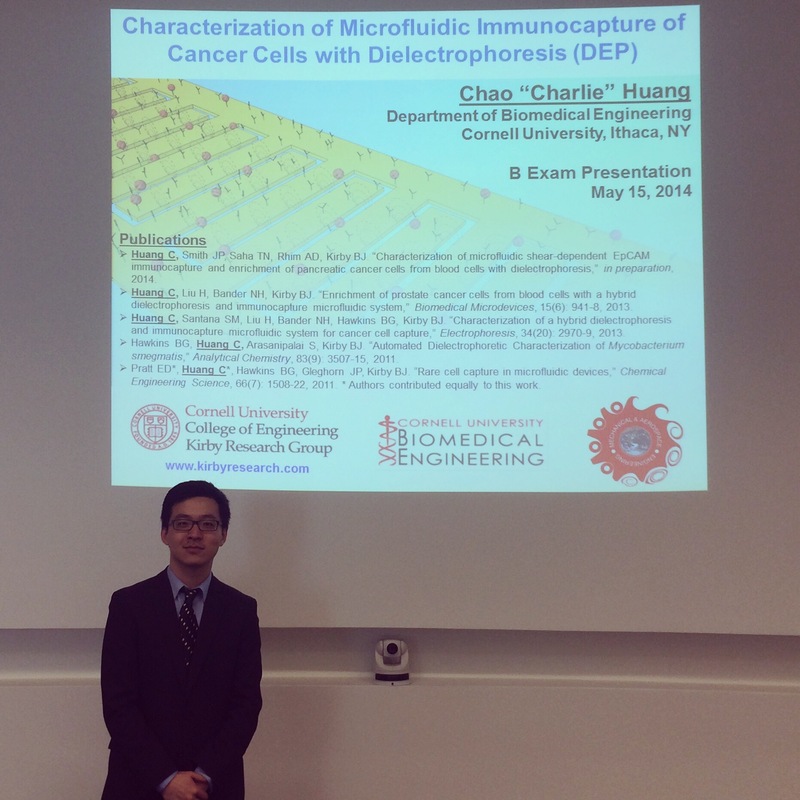 Chao “Charlie” Huang successfully defended his PhD thesis on characterization of microfluidic shear-dependent immunocapture and enrichment of cancer cells from blood cells with dielectrophoresis. Charlie’s thesis committee members included chair Brian J. Kirby (Mechanical and Aerospace Engineering), Susan Daniel (Chemical and Biomolecular Engineering), and Robert S. Weiss (Biomedical Sciences).